TATS A KOOL CHALLENGE: I've gone batty!! Yes, I know you already knew that!! A few words first about the previous post....lots of you had asked me what threads I had dyed and what I was going to use them for...so that what what the post was about...just that!! It got lost of lovely comments about how much you liked the colours...but also lots of enquiries about..was I going to sell my threads????????? or was I just teasing you!! I gave an answer on the comments but I don't think many visitors read the comments...(you just click on the comments link at the bottom of the post, bloggers love comments!). So my answer is worth repeating here. I didn’t mean to tease you with my threads nor am I advertising them, but merely to share my pleasure in this new experience..
Not did I have any intention of setting up an Etsy shop. I don’t know if the HDT market is big enough to take another seller and I don't intend to set up in competition and take trade away from to someone who has given me such pleasure with her threads and who so graciously shared her methods of making them, and has become a friend. High principles, yup! I even feel that I should not buy any of Yarnplayers precious Tourmaline that I adore so that you guys who can't dye wont have to compete with me. If the demand for these threads continues to expand and they feel that another player would not affect their business then that would be a whole new ball game. Even so my supply would be miniscule. Naming the threads brings them to life, My Pumpkin Juice started out simply as marigolds until it suddenly shouted at me 'let me be Pumpkin Juice' a name that has always fascinated me. I never imagined Sherry that anyone else would ever think of it. The ability to dye to match threads you already have is relatively easily done and having just the combinations that you want is just the best. I always disliked the way most varig threads include white. So this to me is bliss and I hope I can continue to share it with you. 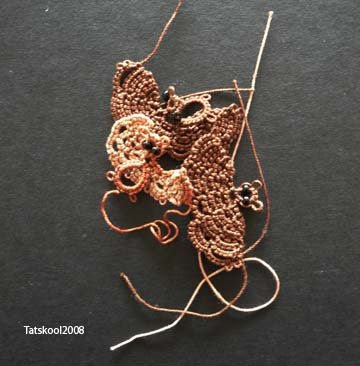 I have been tatting the bat from Martha's new book Holidays On The Block, it's the best tatted bat I have ever seen. Remember I told you I had dyed some threads that had bat and eagle written all over them, well here they are. The orange and brown one is gorgeous and will make a lovely something or other!..the others ..well I still haven't got the perfect dark browns yet. 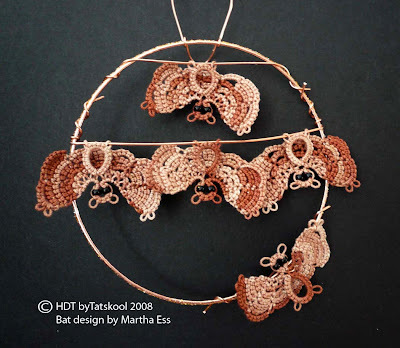 Martha's pattern is quite tricky at first like most great designs especially with lots of vsp to join into..I really needed to concentrate and count my joins and yes practice really does make perfect but not before I had a growing pile of deformed bats lying in front of me. The trial dark brown (doesn't look very dark in the scan but it was) was a trial on my eyes!! Soon got the hang of it tho' and here are my bats snoozing away in their new home. I suprised them with my flash and one is ready to fly away. The thread didn't have a name and I racked my brains until it hit me of course...ta da..drum roll...it's BAT BROWN!! Still not dark enough tho.! My 15 meter skein just made 5 bats..but I had to dismember a dead one to finish the 5th!! More ideas for projects with HDT's to follow, and some luscious colours. The bats look great in your HDT, and I love the way you have them displayed! A tiny bit of help!